In 1932 Fred Phillips and, the undisputed champion of that era, Haydn Bunton were lauded for their brilliant exhibition(s) in the interstate clash between Victoria and South Australia at the MCG. On that day, both players were dominant and led the way for Victoria to a narrow win. However, the fortunes of Haydn and Fred could not have been more dissimilar. Haydn would go on to become one of the game’s most illustrious and celebrated players; while, sadly, Fred Phillips was dead within 12 months of that match at the MCG. 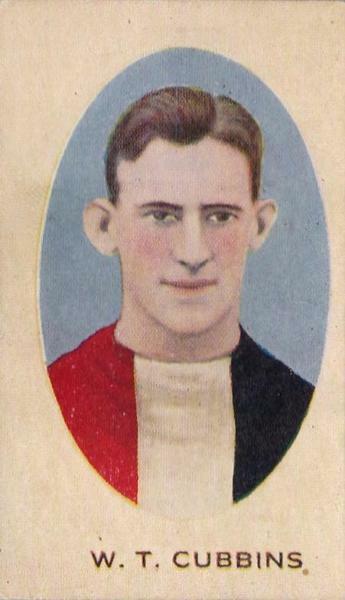 Fred Phillips, one of St Kilda’s best-ever footballers, died in the most tragic circumstances at the age of 27 years. The news shocked the public; and football fans found it hard to believe that such a fine young sportsman had passed away. In reporting the news of his death, the ‘Sporting Globe’ referred to Fred Phillips as a ‘Greatly Loved Sportsman’. The ‘Globe’ ‘got it right’ because Fred was respected by his opponents, admired by his team-mates and loved by St Kilda’s loyal band of supporters. It is hoped that this story helps to keep alive the memory of one of the undoubted champions of VFL football. Frederick Rowden Phillips, born May 1905, was the son Frederick John Edmonds and Sylvia Amy (maiden name: Rowden) Phillips. Fred’s place of birth is given as 64 Brick Street in Richmond; and it is known that medical staff assisted with the birth. Fred (Senior) had three children (Grace, Rupert and Roy) from a previous marriage; and, it is believed, that the family resided at Woodside Crescent in Toorak. Fred’s occupation was listed as: ‘manufacturing chemist’ and; while it can be wrong to make assumptions on such matters, it seems that the family had a steady stream of income and a degree of security. 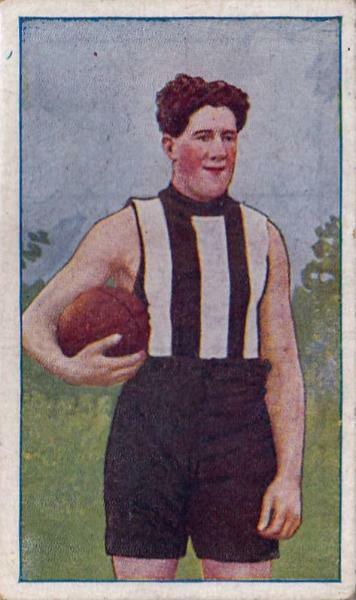 “Frederick is his Christian name, but he is best known as Flops.’ People who attend football matches and have seen the tall, lightly built St. Kilda man in action, naturally thought that he was called ‘Flops’ because he was often bumped to the ground, and fell a lot when taking a mark. This is not so. When Fred attended the Prahran College as a lad the other youngsters would call him "Flips’ for short, and that developed to ‘Flops’…” ‘Sporting Globe’ September 1929 Page: 6. Fred had an innate love of sport; and, while he excelled at football, he was a cricketer of some note. Evidence suggests that Fred was a useful batsman for the Melbourne Cricket Club before crossing to play with St Kilda CC. It was difficult to unearth any details of his ‘scores at the crease’; and it is hard to comment accurately about Fred’s prowess ‘with the willow.’ However, it is believed that he played VCA District Senior XI cricket at some stage. There is also a lone reference that Fred also enjoyed swimming (perhaps not competitively); and it is written that he collected cigarette coupons (cards) which was a very popular hobby for youngsters in those early days. “ Prahran College. The annual distribution of prizes of Prahran College took place at East Leigh on Wednesday. The reports of the principals (the Misses Laing) showed that results of examinations held last December and February, and of pharmacy examinations during that year, had been satisfactory, and that, apart from examinations, pupils in all forms had done much good work, so that the year had proved gratifying. PRIZE LIST. The Walter Finlay Prize (Gift of Mrs. Finlay). -F. Phillips (head of the school)….” ‘The Argus’ December 16th 1920 Page: 5. With a prize for scholarship ‘under his arm’; and a reputation as an all-round sportsman, Fred left the Prahran College and commenced the next phase of his education at Scotch College. His selection in the First XVIII team in 1922 and 1923 was a pointer of his potential. “He had a very sound grounding in sport. He went to Scotch College in 1921 and from that year until 1923 he played football and cricket with the senior teams. He earned a great reputation as a public schoolboy for his skill. In public schools football he usually played at centre half-forward, where his sensational leaps for high marks thrilled lovers of the game.” Page: 6. Scotch College was/is a famous ‘breeding ground’ for footballers; and Fred Phillips is just one of more than 150 students who have graduated to VFL/AFL ranks. Other noted student-footballers include: David Polkinghorne (Hawthorn), Colin Youren (Hawthorn), Bill Morris ( Richmond), Doug Heywood (Melbourne), Ian Law (Hawthorn) and Rod Olsson (Hawthorn). Note: Wally Sharland was a former footballer with Geelong from 1920 until 1925. 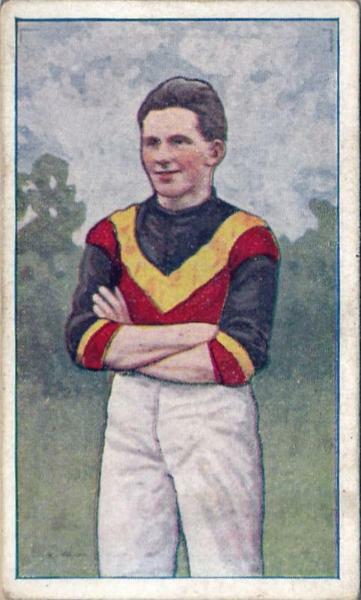 Scotch College gave Fred a solid start in football and he crossed from the Collegians to St Kilda FC in 1924. Fred was selected to make his VFL debut in Round: 5 against Geelong at the Junction Oval. He was a couple of days ‘short’ from celebrating his nineteenth birthday when he took his place alongside such local stars as Wels Eicke, Bert Lenne, Bill Cubbins, Barney Carr and Colin Watson (see below). 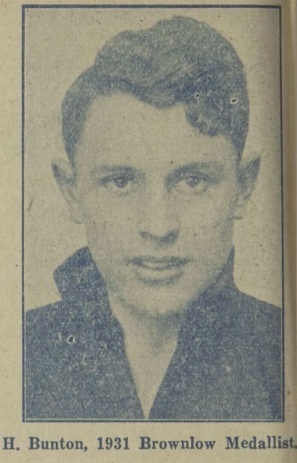 Fred made an auspicious debut and kicked four goals; and helped the Saints to a fighting victory over the Pivotonians (as Geelong was then known) by 26 points. Some 26,000 spectators were at the Junction Oval that day; and the ‘young boy’ from Scotch College would have impressed onlookers with such a strong ‘first-up’ performance. 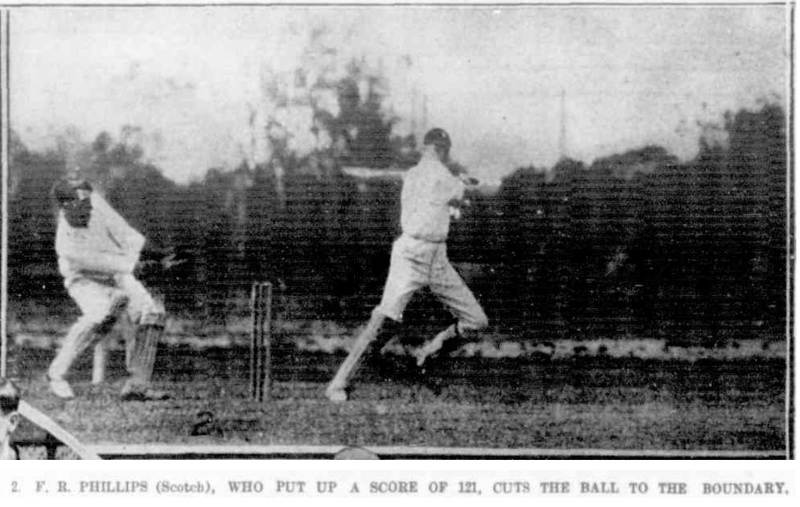 A comprehensive newspaper review of the match exists; and it mentioned Fred Phillips at several points. However, the poor quality print, on the original copy, made it almost impossible to read the article with certainty. Nevertheless, Fred was ‘on his way’ in VFL football; and, after his encouraging debut, he went on to play a total of nine games and kick goals 13 goals that season. 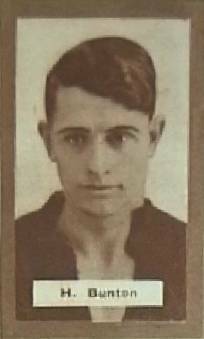 As mentioned above, when Fred Phillips made his VFL debut in 1924, one of his team-mates that day was the brilliant midfielder Colin Watson. As is well known, the inaugural winner (i.e.1925) of the Brownlow Medal was Edward ‘Cargi’ Greeves from Geelong; and the following season, Colin Watson (St Kilda) took out the coveted award. 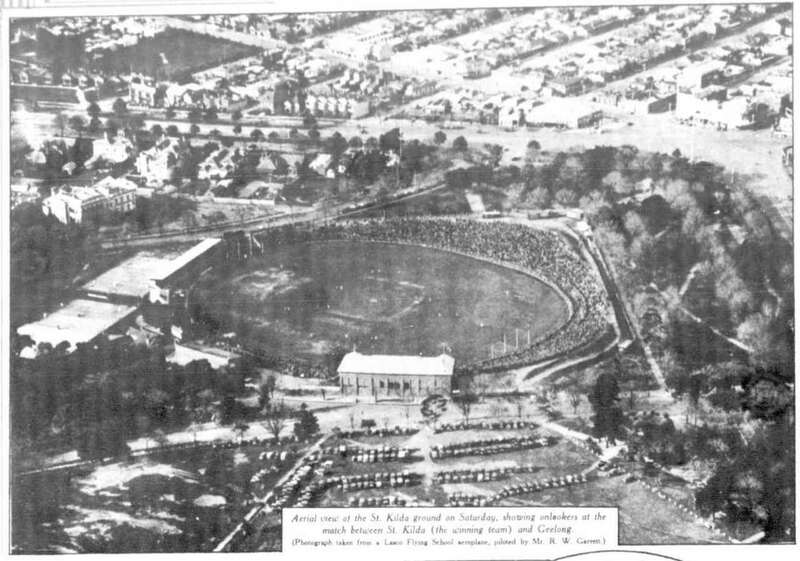 Colin arrived at the Junction Oval, from South Warrnambool in 1920. He didn’t exactly ‘set the world on fire’ in his early games; but with increased game time and, in turn, experience, his all-round brilliance came to the fore. Although winning the Brownlow in 1926, he stunned the St Kilda committee and fans when he accepted a coaching position from country club Stawell. Much has been written about the ensuing turmoil created by that decision as it caused St Kilda and the VFL much angst. It was a highly publicized and controversial episode in that era of league football. After seven years in the ‘wilderness’ of country football, Colin returned to St Kilda FC and quickly reaffirmed his status as a champion of the game. 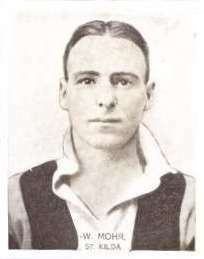 In summary, despite an interrupted and contentious career, Colin Watson was a foremost VFL footballer in those years between the wars. Fred Phillips was a highly skilled and stylish footballer; and was said to be a strong overhead mark. Standing at 183 cm, Fred could hold down key positions in defence or attack. He had an added advantage, over many footballers of that era, because he could kick proficiently with both feet. In those early days of football, many players were ‘branded’ as ‘one-sided’ which meant that they turned the same way on each occasion when winning possession of the ball. Such players were/ are ‘predictable and therefore vulnerable’ with close checking. “If a player teaches himself to kick with either foot, turning to his left or right will come easily.” ‘Football the Australian Way’ Page: 41. Fred Phillips played football well before Bob Skilton was born but the two men shared the fine art of being * ambipedal. Fred was ahead of his time in that aspect of the game. Note: The word ‘ambipedal’ is a technical term which simply means to: ‘use both feet with equal ease.’ It is seldom used these days in regard to kicking in soccer and football. In Australian Rules football, Dennis Marshall ( Geelong) and Jason Akermanis ( Brisbane /Footscray) were two players who possessed superb kicking skills with both feet. In the match review, as published in ‘The Argus’, Fred Phillips received kudos for his brilliant exhibition in defence that day …. “Phillips (half-back) was St Kilda's sheet-anchor, for hardly an error could be debited against him. He marked finely, and was never at a loss to place the ball to advantage”. July 18th 1927 Page: 9. A story about Vic Cumberland can be found on this website. Most footballers experience a nadir in their careers; and 1928 was Fred’s ‘annus horribilis’ as he struggled to maintain consistent form. Newspaper reports indicated that he had ‘lost touch’ and, in turn, self- confidence (which is a key to success in all sports). In 1928, Fred Phillips played only eight senior games and found himself relegated to the Second XVIII. VFL records indicate that Fred missed consecutive games from Round 8 to Round 15; and that may imply that other factors were involved in Fred’s prolonged exclusion from the senior team. “Last season Phillips had an off year. By many supporters it was considered that he was not treated too well, in being left out … certainly he was not playing at his best, but he appeared quite good enough to hold his place. The extraordinary feature about his omission from the senior eighteen was that after the resignation of captain of Horrie Mason, Phillips was in charge of the team that defeated North Melbourne. Later he was dropped and had to be content with a run in the seconds. Phillips was naturally upset at his fall, but determined to get back into the senior side”… ‘Sporting Globe’ September 14th 1929 Page: 6. In Fred Phillips’ case those words rang true, because in 1929 he bounced back into VFL senior football better than ever. The disappointments of 1928 soon faded into the background as Fred re-ignited his football career with some strong performances early in the 1929 season. In Round: 4 against Fitzroy, at the Brunswick Street Oval, Fred kicked a ‘bag of nine’ in a sterling display. The final scores being: St Kilda 16.21 (117) to Fitzroy 12.8 (80). 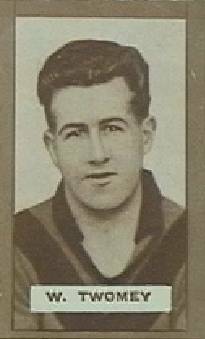 The goal kickers for St Kilda were: Fred Phillips 9 Danny Warr 3 Arthur Ludlow 2 Roy Bence 1 and Frank Hutcheson 1. Throughout his senior VFL career, Fred Phillips kicked a total of 107 goals which included a return of seven against Hawthorn at the Junction Oval in 1925. Fred’s career tally of goals, illustrates his versatility to go forward at ‘a pinch’ when required by the coach. Such players (e.g. 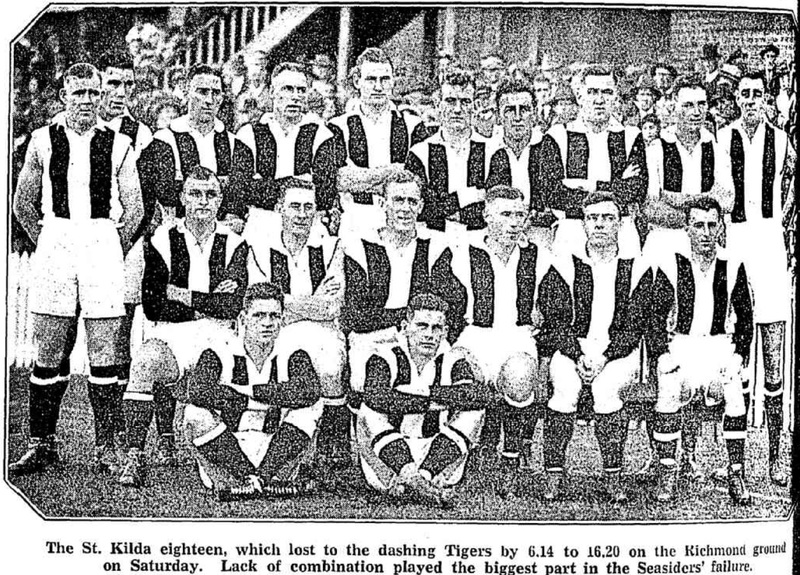 Verdun Howell-St Kilda, Tom MacDonald-Melbourne and Footscray’s champion Ted Whitten) are ‘worth their weight in gold’ in football teams. 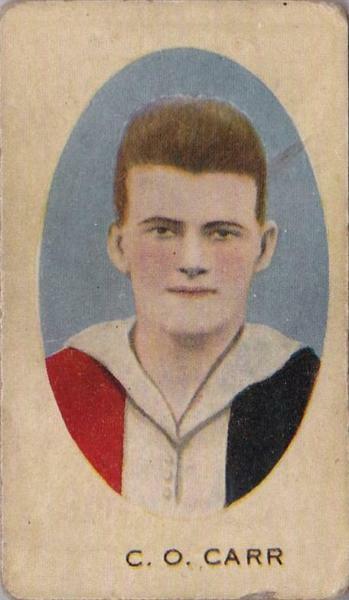 Fred Phillips had played more than sixty games when the St Kilda selectors took a gamble on a raw- boned, nineteen-year old forward from Wagga, named Bill Mohr. 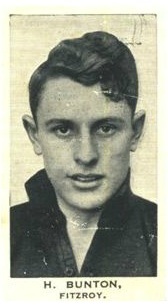 Bill was chosen to play in the opening round of the 1929 season against Hawthorn at the Junction Oval. 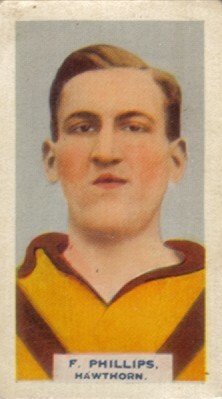 In time, Bill Mohr became one of the finest forwards in the history of the game; and, in a VFL career of 195 games, he kicked 735 goals. 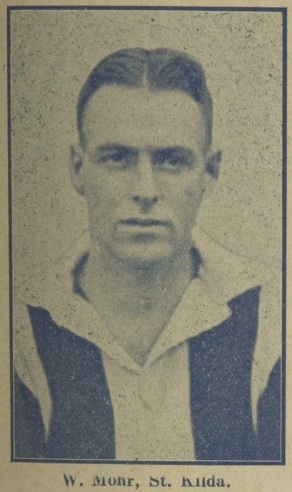 Bill won the club’s goal kicking award for twelve successive seasons (1929-1940). 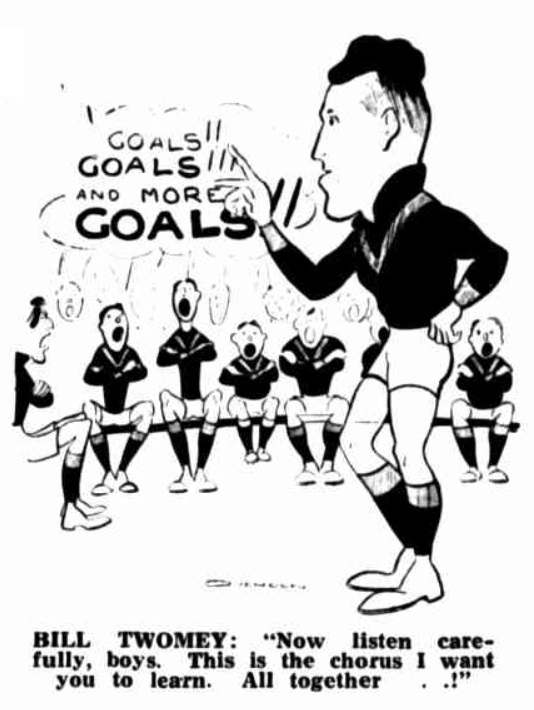 “ Lithe and nimble, Mohr regularly won State selection from his second season , when he finished second in the goal kicking to his long-time rival , Collingwood’s Gordon Coventry.” ‘The Complete Guide to Australian Football.’ Page: 188. 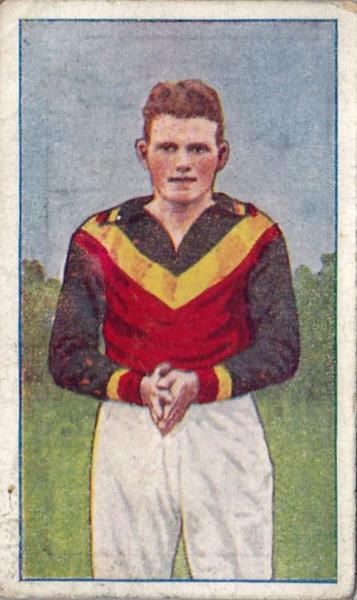 In 1936, Bill kicked 101 goals and, during his lengthy and distinguished career, he represented Victoria on 18 occasions. 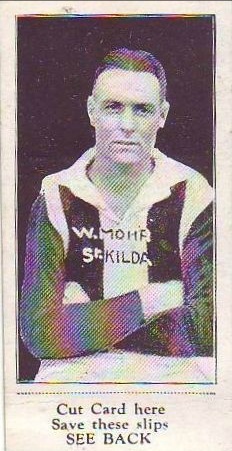 Bill Mohr was a football idol of ‘his time ’; and there was little surprise when he was selected in St Kilda’s ‘Team of the Century.’ Bill was named on the half forward flank and Tony Lockett was selected at full forward. While Jock McHale’s ‘well-oiled Magpie machine’ cut a swathe through the opposing teams in 1929; St Kilda performed consistently under George ‘Sugar’ Sparrow. In an exciting end to season the ‘Seasiders’ literally fell into the Final Four at the end of the home and away series ( 12 wins). The first Semi-Final was played at the MCG against Carlton; and 58,481 people witnessed a close and tense contest. Reading between the lines, the Saints, although weakened by injury, were gallant in fighting back after a goal-less first term. St Kilda was far from disgraced in that match despite being disadvantaged by the loss of key players that day. Throughout the history of the game, injuries really handicap teams in finals; and, unfortunately, the hapless Saints came to appreciate that ‘fact of football life’ through bitter experience. “Fred Phillips was the star of the match playing the best game of his career…” ‘Courage Book of Finals ’ Page: 90. The final scores were: Carlton 12.9 (81) defeated St Kilda 11.7 (73). “Phillips…was easily the best man on the ground. His high marking was magnificent, and half-forward or halfback he was hardly ever beaten. 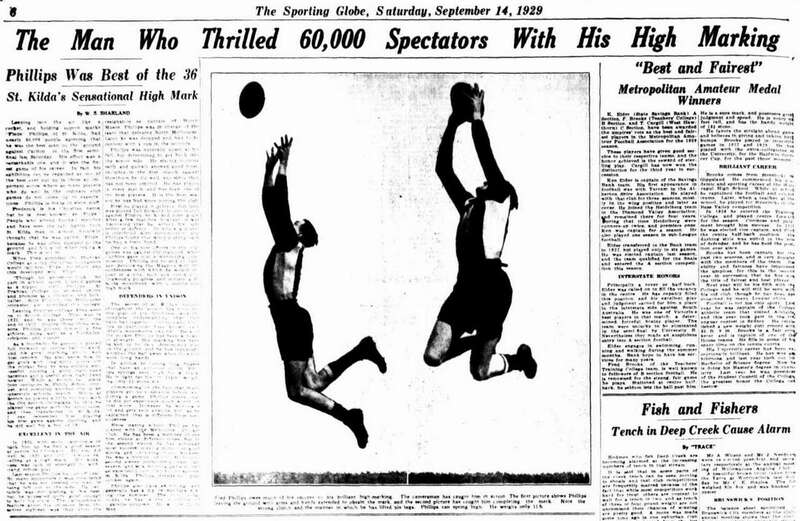 Horrie Clover, of Carlton, who also played great game that day, praised Phillips' exhibition as one of the best he had seen.” ‘Sporting Globe’ April 22nd 1933 Page: 6. Other players to serve the Saints well in that final were: Bill Cubbins, Harold Neill, Roy Bence, ‘Horrie’ Mason, Bill Roberts and Alan Scott. In 1929, Collingwood continued on its emphatic march into the VFL annals by winning its third successive flag. “…he ( Fred) was one of the finest marks in the game.” Page: 679. Without film footage, it is hard to compare Fred’s marking ability with the other great high marks of other eras. However, an article ( June 12th ) of the ‘Sun News Pictorial ’ newspaper, in 1924, provided a guide to how Fred’s high marking was rated by the spectators. In the newspaper’s popular column entitled ‘Fifty –Fifty’, readers were asked to vote on who they thought were the best high marks in VFL football? 7. 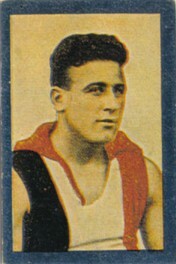 Norm Cockram (Fitzroy -23 votes). 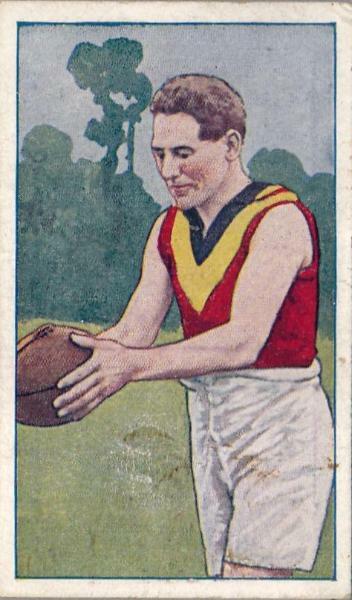 The popular number: one choice also supports the notion (suggested by doyens) that Horrie Clover was probably the greatest forward in that era of VFL football. It is documented that Fred Phillips played for Victoria on five occasions. In August 1930, Fred made the sporting headlines when he replaced Footscray’s Harry Hickey in the line-up for interstate clash against South Australia at the 1930 Adelaide Carnival. “… Phillips (St.Kilda) Displaces Hickey. The selectors to-night decided that in view of the wintry conditions and the shocking condition of the Adelaide Oval a lighter player should be included in place of Hickey on the half-back flank of the Victorian side. Phillips was the favourite or the position, and was chosen.” August 9th 1930 Page: 17. 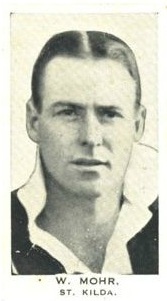 Bill Mohr was selected at full forward; and other players named in the Victoria team, for the trip to Adelaide, included: George Todd (Geelong), Alan Hopkins & Alby Morrison (Footscray), Jack Titus & Maurie Hunter ( Richmond), Jack Cashman ( Fitzroy), Colin Martyn ( Carlton) and four players from Collingwood: Harry Collier, Sid Coventry, Albert Collier and Harold Rumney. It was star-studded team and the Victorians won the match comfortably by 39 points. The final scores were: Victoria 12.11 (83) defeated South Australia 7.5 (47). 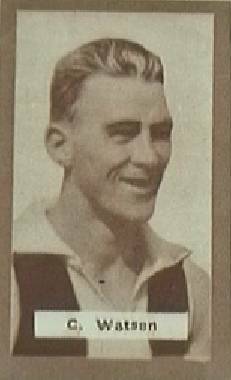 In 1930, Fred played his 100th VFL game. 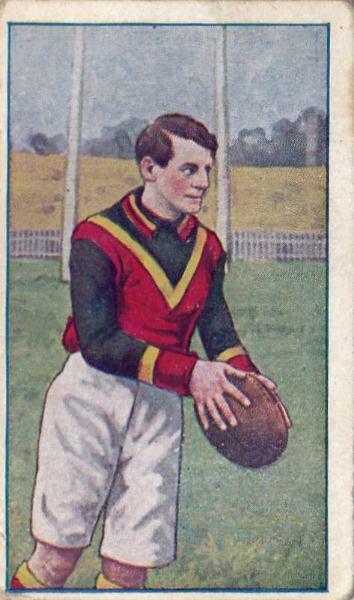 The match was against Richmond, at Punt Road, in Round: 18; and it capped off a memorable season for Fred as St Kilda won, a tight contest, by 10 points. “…St Kilda had in Phillips the best player on the field. His anticipation in defence was uncanny. He always seemed to be in the right place and marked wonderfully.” ‘The Argus’ September 15th 1930 Page: 13. 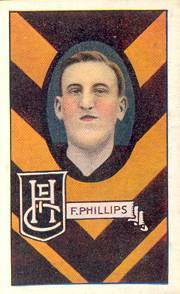 As mentioned above, 1930 was a season of ‘good returns’ for Fred Phillips as he won the Club’s Best & Fairest Award. Note: The award is now known as the ‘Trevor Barker Award.’ Like Fred, Trevor Barker died at young age (39 years). Trevor’s death shocked the football community and it that it broke the hearts of many Saints’ fans as he was a much loved figure in the history of St Kilda FC. Not only was he a crowd favourite but Trevor was one of the most spectacular high marks of his generation. Other team-mates of Fred Phillips to have won the coveted award in that era included: Colin Watson (1924), Cyril Gambetta ( 1925), ‘Horrie Mason’/ Harold Matthews ( 1926-27), Bill Cubbins ( 1928-29), Harry Neill ( 1931) and Bill Mohr won the award in 1931. 1931 was a stellar season for Fred Phillips as his performances rose to new levels. 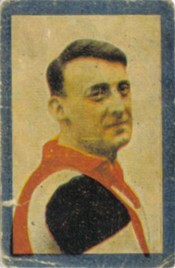 In 1931, Fred polled 14 votes in the Brownlow Medal count which placed him in eighth position ( but well behind the leader, Haydn Bunton of Fitzroy). Haydn won the first of his three medals that year with 26 votes. Other vote winners in 1931 included: Alan Hopkins ( Footscray – 25 votes), Reg Hickey ( Geelong- 19 votes) and John Lewis (North Melbourne 17). Three players ( Ivan McAlpine, Percy Beames and Stan Judkins) each polled 15 votes. In 1932, Fred was well up again in the voting again with 10 votes; but Haydn Bunton was a clear winner again that season with 23 votes with George Moloney, from Geelong FC, gathering 16 votes. 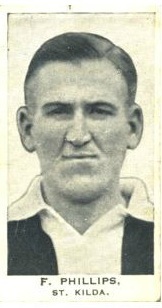 Throughout his career, Fred Phillips polled a total of 32 Brownlow Medal votes. Note: Younger readers may be interested to know that the system of voting for the Brownlow Medal has varied over the years. 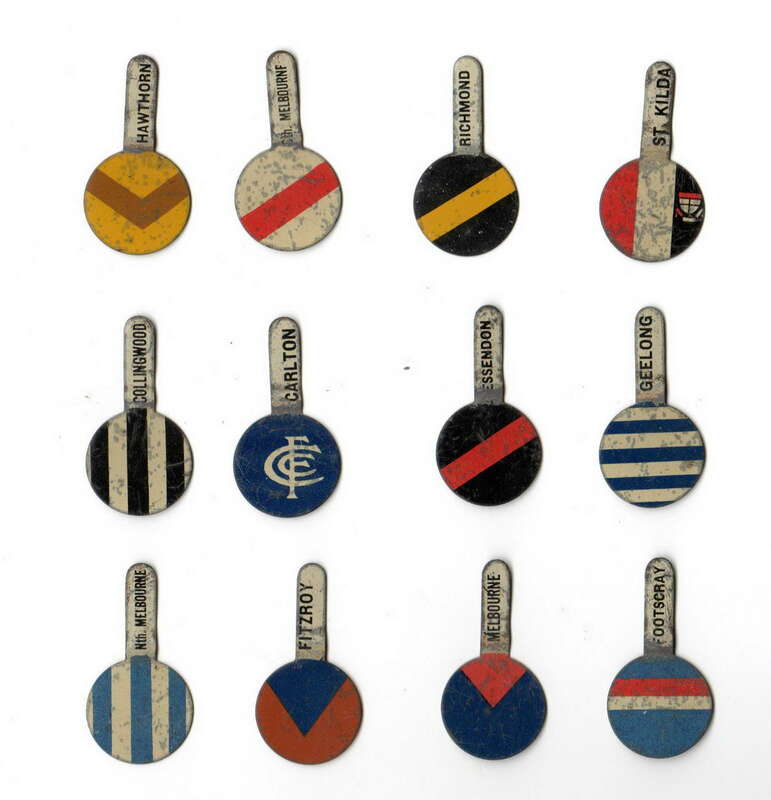 In the period 1924-1930, the field umpire awarded just one vote for the best player; but in 1931 the 3-2-1 voting system for the three best players was introduced into VFL football. 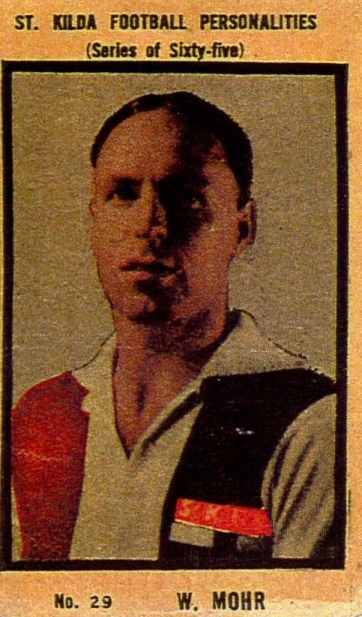 Haydn Bunton was the first player to win the Brownlow Medal winner under that ‘newly’ adopted/introduced system in 1931. 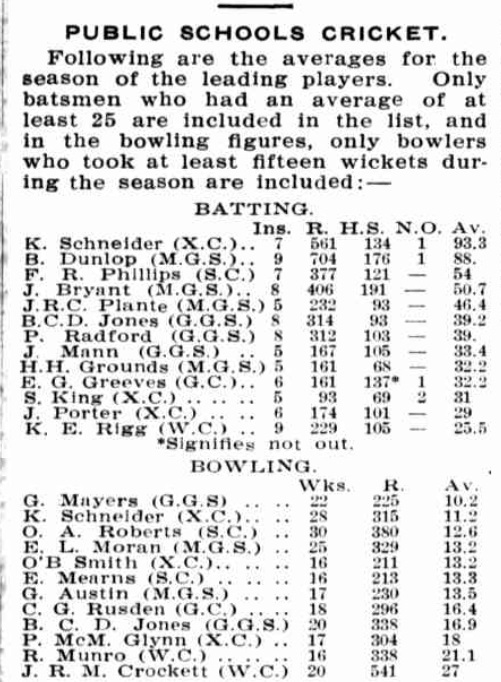 Further evidence of Fred Phillips’ striking form in 1932 was that he was again chosen to play against South Australia. On that occasion, Fred didn’t have far to travel as the match was played at the MCG on June 11th 1932. 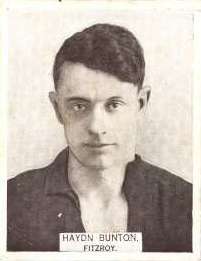 Although Fred was named as the 19th man, he was a late inclusion into the starting line-up because of the withdrawal of Frank Murphy (named CHF in the original team). The Victorian line-up included such entities as: Keith Forbes, Ivan McAlpine, Percy Bentley, Harry Vallence, Reg Hickey, Jack Titus, Austin Robertson, Bob Pratt, Charlie Gaudion, Haydn Bunton , Gordon Strang and Charlie Davey. 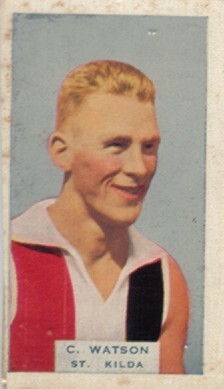 Fred’s team mate from St Kilda, Billy Roberts was chosen on the wing that day. Billy was recruited from Oakleigh /Wesley College; and he was a classy midfielder who went on to play 160 VFL games. Billy represented Victoria on six occasions; and is another player who deserves greater acknowledgment for his achievements in club and interstate football. On the day of that eagerly awaited interstate clash, the MCG was being used for the first time since a major upgrade; and the playing surface was very ‘heavy’ underfoot. ‘Heavy’ may have been an understatement as several areas of the oval were a ‘quagmire’; and, a well-known scribe of that era, ‘Old Boy’, mentioned that the mud was ‘ankle deep’ at some points on the ground. The breeze was significant in assisting the home side ‘hit the scoreboard’ early. However, the South Australians were not to be denied; and challenged the powerful Victorian combination in every facet of the game. “…Victoria had two men who stood out beyond their fellows. Bunton who roved well and was always busy and Phillips, who coming into the team in the place of Murphy, who had a poisoned leg, played a very fine game either half forward or forward. He marked and kicked well and did much useful work” ‘The Argus’ June 13th 1932 Page: 13. It had been a ‘mud wrestle’ from the first bounce; but the small crowd of 21, 590 had witnessed an exciting and ‘no holds barred’ contest between the best footballers in the land. Goal kickers for Victoria: Phillips 3 Titus 3 Vallance 2 Forbes 2 Bunton 1 and Davey 1. Best players for Victoria: Bunton Phillips Walker Robertson Pratt Strang and Gaudion. 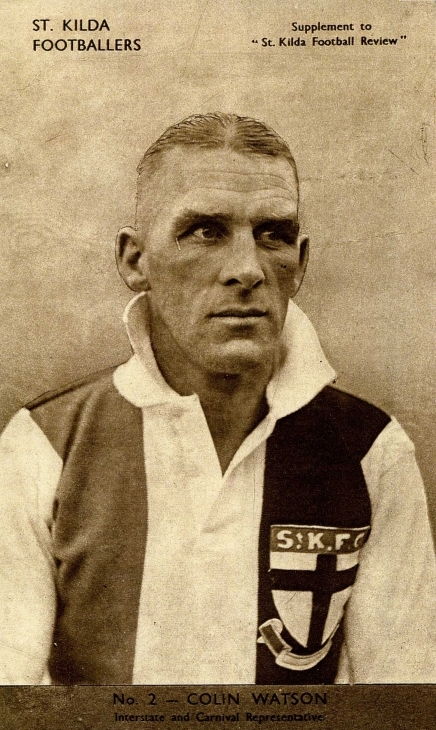 During Fred Phillips’ nine seasons with St Kilda FC there were seven coaches: Wels Eicke ( 1924) , Norm ‘Hackenschmidt’ Clark ( 1925-26) , George Haines ( 1927), George Sparrow ( 28-29), Bill Cubbins ( 1930), Charlie Hardy (1931-part of 32) and Stuart King ( Rounds 8- 18 in 1932). 1. All the coaches were former noted and experienced footballers with a combined total of more than 800 VFL senior games. 2. Despite such experience, only one coach (i.e George Sparrow) lifted the Saints into a finals series (1929). 3. None of the above coaches lasted more than two seasons at the helm of St Kilda FC. 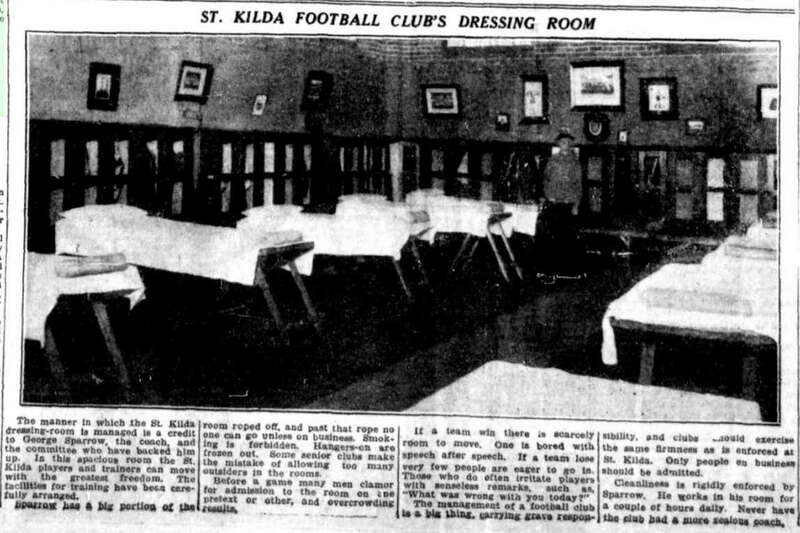 St Kilda was a stormy club in those days; and it appears that there was a ‘rotating door’ policy at the Junction Oval as coaches entered, briefly lingered and then departed for other destinations. Instability in leadership is devastating in football clubs; and, although the Saints were often combative and competitive on the field, the team never realized its collective potential during that era. Fred Phillips’ last season at St Kilda must have been a bitter experience. Charlie Hardy was sacked as coach at Round: 7, and defender-follower Stuart King was handed the job. Charlie’s dismissal was an acrimonious affair which resulted in him taking legal action against the club. A well-worn adage in football and politics is that ‘disunity is death’; and the chasm, that opened up at the Junction Oval, could not be bridged by Stuart King. Every article studied about the conflict at St Kilda in 1932, suggests that the club had become shambolic after the ‘big split’; and it was reflected in the club’s standing on the VFL Ladder. The Saints finished 11th on the table with just three wins; and only percentage ( 7.9%) separated St Kilda from Hawthorn ( the winners of the ‘Wooden Spoon’ that season ). 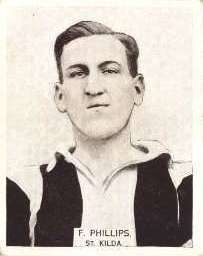 After 134 games with St Kilda, Fred Phillips was persuaded to cross to Hawthorn FC at the end of the 1932 season. He was 27 years of age when he played his last game for St Kilda, against Carlton, at the Junction Oval. It was a most ‘forgettable’ day for Fred as the Blues trounced the Saints by 13 goals. No one will ever know if Fred had it in the back of his mind to ‘part company’ with the Saints after that crushing defeat. Such thoughts are generally private matters as players weigh up the ‘pros and cons’ of trading allegiances. However, to put it mildly, the Saints were in disarray; and Fred Phillips would not have been human to have dismissed any lucrative offers from another clubs. In the end, Fred made a choice and severed his bonds with St Kilda. Note: History shows, that it is not an easy step for footballers to transfer to other clubs. (e. g. Ron Barassi’s decision to leave Melbourne to coach Carlton in 1965 was a classic case in point). Other players VFL involved in bitter clearance wrangles include: Colin Watson (see above), Ron Todd and Des Fothergill ( Collingwood to Williamston); and when John Pitura tried to cross from South Melbourne to Richmond, in 1975, it was a though war had been declared. 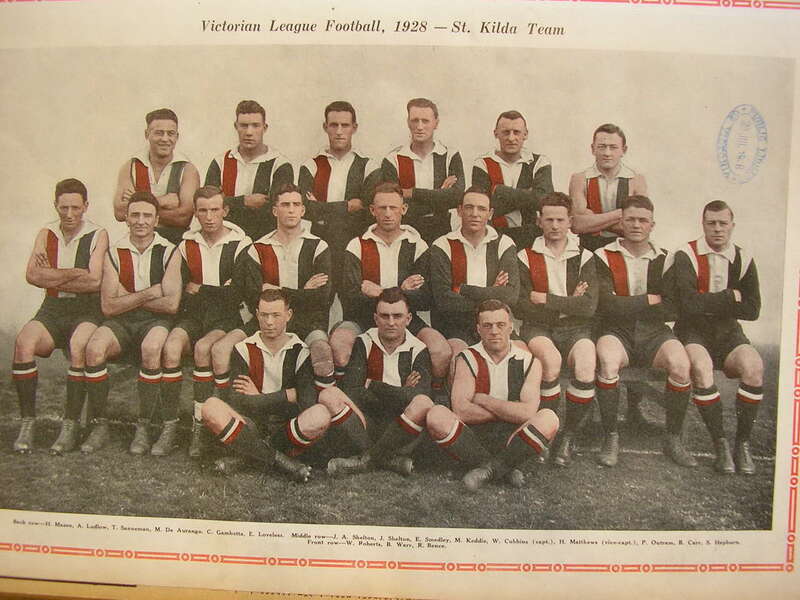 •	In the period 1932-61, St Kilda finished in the Final Four in only two seasons i.e. 1939 and 1961. •	In those three decades, St Kilda finished in the ‘bottom three’ on the VFL Ladder on fourteen occasions. •	The club won the ‘Wooden Spoon’ six times - (1945-47-48-52-54-55). 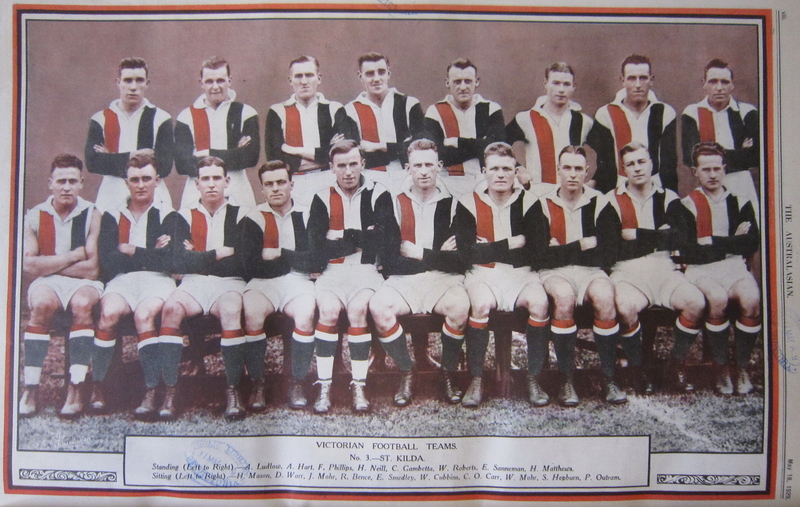 •	Between the years 1932-61, St Kilda had fourteen coaches. 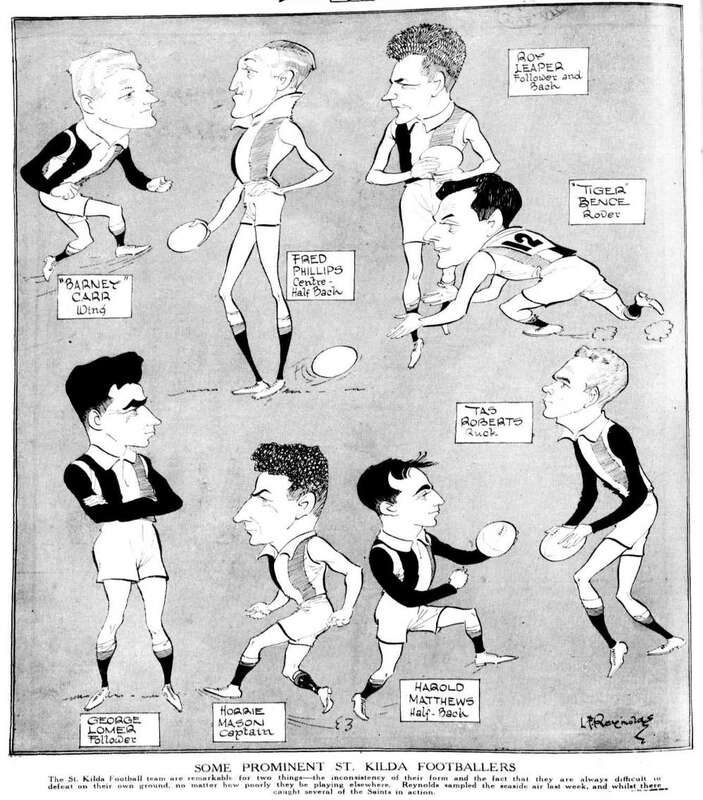 •	Of the fourteen coaches appointed at St Kilda from 1932 until 1961, nine could be defined as ‘short term’ appointments (i.e. one or two seasons) before departing from St Kilda FC. •	In the period 1945-1995, St Kilda won only 38 games of the 208 games played by the club; and that calculates to be a ‘win-loss ratio’ of 18.5%. Note: In 1961, St Kilda appointed Allan Jeans as coach; and he went on to break all records regarding coaching tenure at St Kilda FC. Allan coached the Saints for sixteen consecutive years (a total of 332 games); and steered the club to its first VFL premiership in 1966. Fred’s departure was a huge loss to St Kilda’s stocks but it was an astute, perhaps inspired, piece of recruiting by the Hawthorn FC committee. “ Pleases Hawthorn….Hawthorn feel bucked by the coaching and leadership of Fred Phillips. Officials consider that he will prove successful as a coach.” ‘Sporting Globe’ March 29th 1933 Page: 8. Just three weeks after the above optimistic press report, regarding pre-season training, Hawthorn suffered a catastrophic loss …Fred Phillips died. “FOOTBALLERS all over Victoria and in other States, were shocked to hear of the death on April 21 of Fred Phillips, the recently-appointed playing coach of Hawthorn and former St Kilda champion. ‘Flops’ he was known to St Kilda supporters, died from the effects of blood poisoning which is thought to have been caused by a boil.” ‘The Weekly Times’ April 29th 1933 Page: 63. “The only intimation anybody had that Phillips was not well was a statement that he did not train on the Tuesday evening because he was feeling the effects of an injury to a foot sustained in a practice match the previous day. This injury, and a slight chill, kept Phillips to his bed on Wednesday. On the following day, serious symptoms appeared and made alarming progress. Despite all that the best medical attention could do, Phillips failed to rally. The cause of death was pneumonia, on which septicaemia supervened.” April 26th 1933 Page: 13. The Scotch College website provided a little more information about Fred’s death …. It is known that, among the various clothing dyes used in earlier times, there were some colouring agents that were regarded as toxic if ingested or happened to enter the blood stream (via an open wound etc. ). The fact that Fred had a boil may also explain the cause of his tragic death through septicaemia (aka sepsis). Note: Although it is impossible to prove, perhaps Fred actually had a carbuncle ( as distinct from a solitary boil). “Mr L. H. McBrien, secretary of the V.F.L., stated this morning that Phillips' loss to football was incalculable, as he was such a great sportsman. All sporting bodies will be represented at the funeral on Monday morning.” ‘Sporting Globe’ April 22nd 1933 Page: 6. 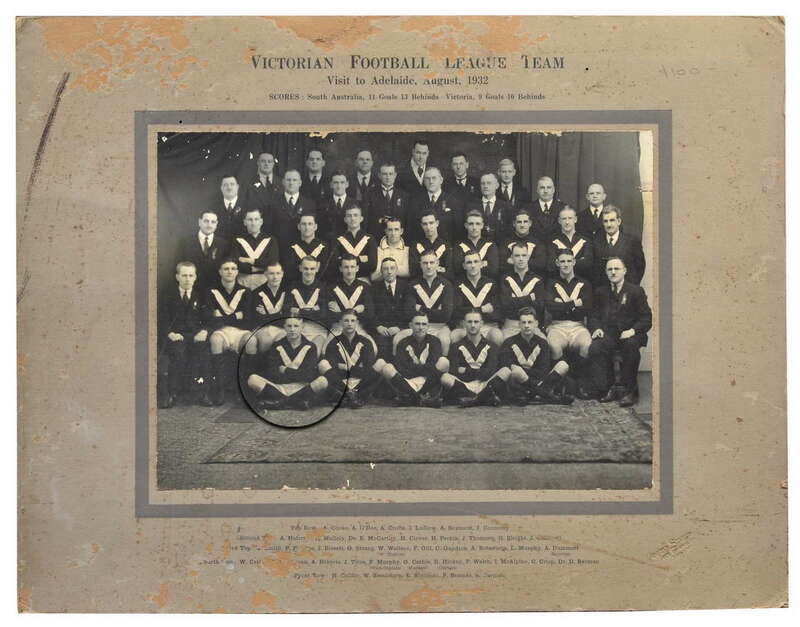 Note: Mr L. H. McBrien (above) was secretary of the VFL from 1929 until 1956. His full name was Likely (aka Like) Herman McBrien; he was born in 1892 and died in 1956. He was also a member of the Victorian Legislative Council from 1943-49. 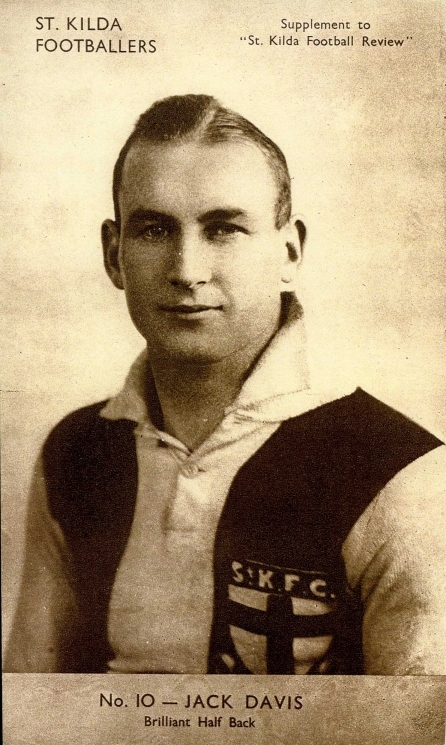 Likely McBrien was awarded an OBE in 1950 and was inducted into the Australian Football Hall of Fame in 1996. Fred Phillips was buried in the Melbourne Cemetery on the following Monday; and a huge crowd, travelled in a motor cavalcade, through the streets of the city, to attend the burial service. 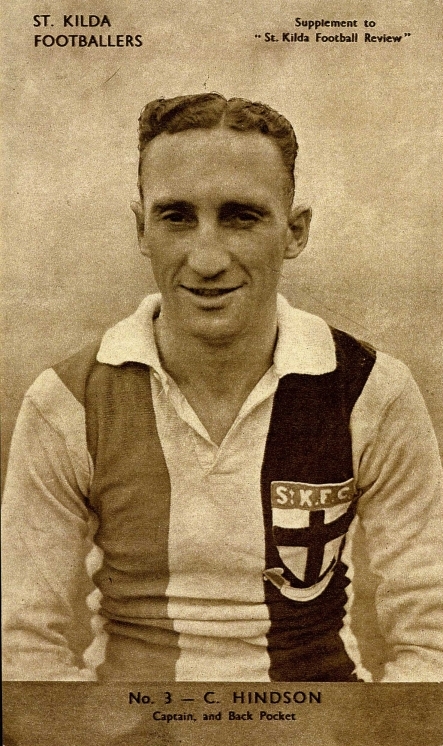 "FOOTBALLER'S FUNERAL Tribute To F. R. Phillips MELBOURNE, Monday A great tribute to the memory of the late St Kilda player and recently appointed coach of the Hawthorn Football Club, was paid by a crowd of 1500 which attended tho burial service in the Melbourne Cemetery today. 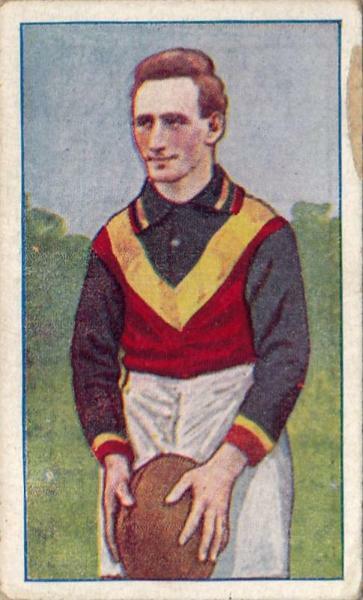 Mr Phillips, who had played for St. Kilda for nine seasons, and also represented Victoria in Interstate contests, died suddenly on Friday night, aged 27. Almost every football and cricket organisation in Melbourne was officially represented. There was a large representation of present and past players, committeemen, coaches, secretaries and supporters of every league football club, and friends and relatives. In the crowd was a big sprinkling of women. The funeral moved from the residence at 10 Meadow Street, East St. Kilda, of Mrs S. A. Phillips, the dead man's mother. Three-quarters of a mile long, it passed round the St. Kilda football Ground where the flags were at half mast, and passed by way of Queen's Road and St. Kilda Road, through the city, to the cemetery. More than 200 cars followed the hearse.” ‘Riverina Herald’ April 25th 1933 Page: 3. As can be imagined, Hawthorn FC was in a ‘collective’ daze following Fred’s sudden death. In retrospect, the HFC committee deserves immense credit for its decisive action, when under such duress, to fill the breach left by Fred’s passing. HFC made the best of a troubled situation and appointed former Collingwood centre man Bill Twomey (Senior) as coach. Bill had been in the ‘bush’ coaching for a considerable time but accepted the offer from Hawthorn and returned to Glenferrie Oval. Bill did not take up the position until Round: 5 and, in the interim period, Arthur Rademacher ‘held the fort’ until Bill arrived and took control. 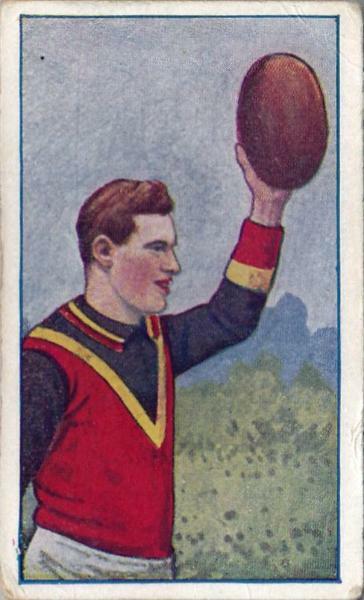 Arthur, who had played 101 games with South Melbourne (1913- 20), had the honor of coaching Hawthorn to a win over St Kilda in the Round: 1 in that season. Looking back, it must have been an inordinately difficult job for Bill Twomey to ‘pick up the pieces’ of a club in a state of anguish and confusion. Bill was ‘on a hiding to nothing’ in accepting such a difficult coaching offer ; and his decision to coach Hawthorn , at that time, was indeed a measure of his great character and humanity. “ PHILLIPS. — In loving remembrance of our dear cousin, ' Fred, who passed away 21st April. 1933, at St Kilda. A good sport. One of the best. —Inserted by his loving cousins, Ernest, Sydney and John Phillips. PHILLIPS. — A tribute to the memory of our late coach and clubman, Fred (‘Flops’) Phillips, who departed this life on 21st April. 1933. Inserted by the Hawthorn Football Club…” ‘Family Notices- Column of the Age’ April 21st 1934. “…ST. 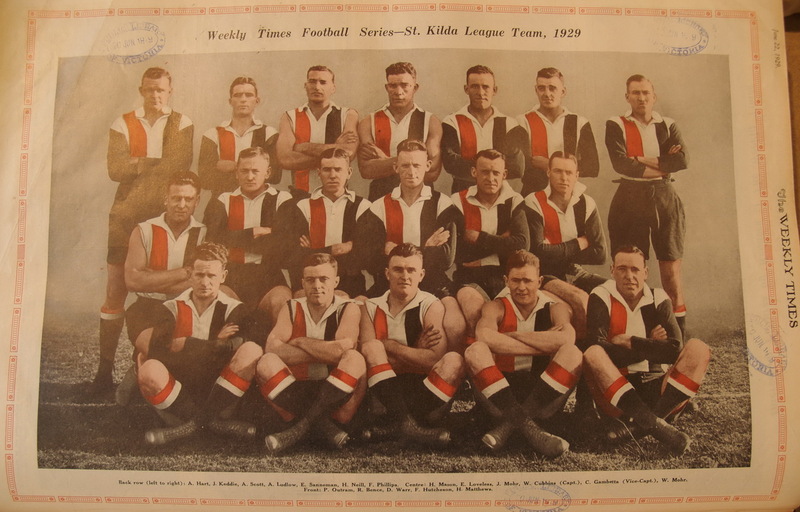 KILDA CHAMPION ‘Fred Phillips’ Memorial Cup….Mr F. Lord, the former secretary of the St Kilda Football Club, initiated a movement some months ago to establish a memorial to the late Fred Phillips, a former player of the club. 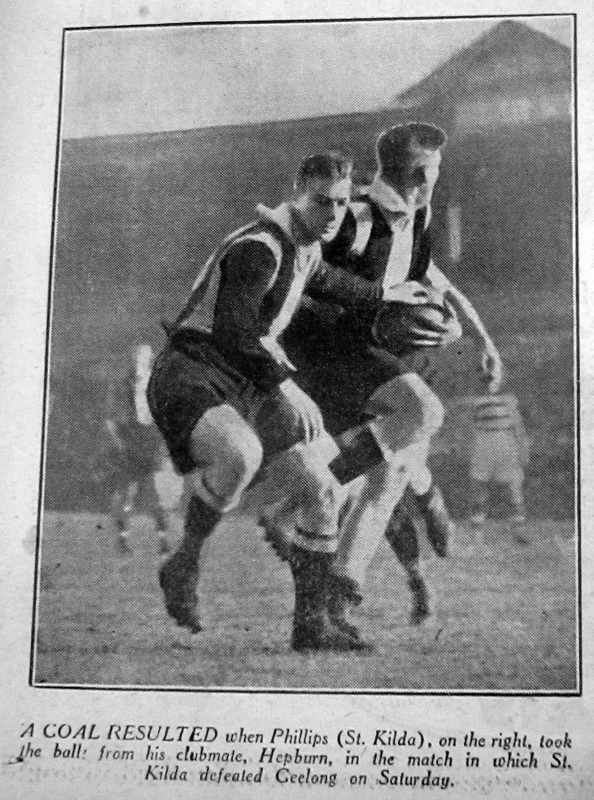 It was decided that this should take the form of a cup to be awarded each season to the player considered to be the champion of the club decided by vote each week…” ‘The Argus’ October 12th 1934 Page:14. The first winner of the Fred Phillips Memorial Cup that season was *Clarrie Hindson with 20 votes; and the runner up with 17 votes in the award was Jack Davis (ex- Trinity Grammar). Colin Watson (see above) polled 15 votes to finish third. 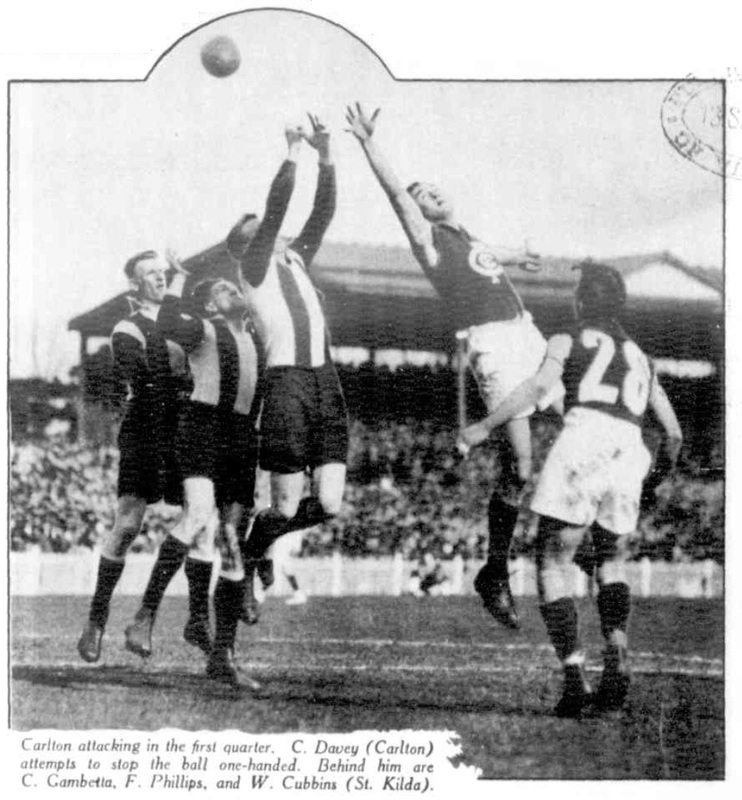 Note: Clarrie Hindson crossed to St Kilda FC from Brighton Vale Amateurs in 1930 and played 90 VFL games. 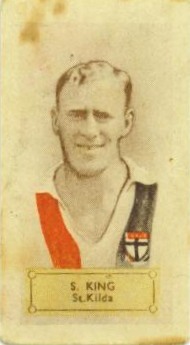 Charlie was the club captain in 1935. With the passage of time, the exploits of many footballers, of previous eras, have been forgotten. The everlasting pity of overlooking past players is that there is so much to learn about their families, their sporting fraternities and the vital importance of football to our national psyche and well-being. 1. To explain the unusual circumstance of his death; and for youngsters to appreciate the vast improvement in sports science/ medicine, first-aid standards, authorized apparel, health and safety procedures/regulations and player support at all levels of football. Finally, Fred Phillips was an endowed player who was at the peak of his sporting career when struck down in a most unexpected and unusual fashion. Special thanks is expressed to Russell Holmesby for his assistance in clarifying historical aspects of Fred Phillip’s family background. Russell’s willingness to share his wide knowledge of the history of St. Kilda FC is greatly appreciated.